To look at the Lenovo Yoga 910 is an absolute triumph. That trim bezel, ultra-high resolution and great-looking watchband hinge ensure it's one of the better looking laptops on the market, without overdoing its bling thing. But the fan noise undoes much of this goodness, especially at this huge price point. Laptops keep getting thinner, lighter and ever more stylish. Among our favourite convertible Windows-based laptops is the Lenovo Yoga series, which has been tweaking its 360-degree hinge-based formula over the years. In the Lenovo Yoga 910 that means ultra power, ultra slimness and an ultra-trim bezel around the screen - which brings this fashion-focused, adjustable laptop in-line with its nearest Dell XPS competitor. The Yoga 910 is quite the ultra-laptop at first glance, then, but having used one for a week does it disappoint in the details? Which is the best Microsoft Surface device for you? The age of giant bezels is almost over. That's the thing that immediately sets the Yoga 910 apart from most of its competition: the edge-to-edge display style which fills to the side and upper edges with mere millimetres of the black stuff. Well, it's sort-of edge-to-edge. Like any screen, there has to be some bezel to contain the display, but it's the lower bezel that perplexes - because it's about 10 times thicker, like a large black bar across the bottom of the screen. It undoes some of the other three bezel edges' achievements. That aside the Yoga 910 is one ridiculously good-looking laptop. Sure, that "watchband" hinge could be a little too bling for some tastes, but we think it looks sophisticated and, especially in its grey/silver finish, understated compared to its champagne gold-colour alternative (no whacky orange colours are available for this newer generation). For a 13.9-inch laptop the Yoga 910's 14mm thickness is slim, but doesn't lead to the abandonment of the traditional USB port. There's one USB 3.0 fitting, along with two C-Type connections on the opposite side of the device. So Lenovo could have probably made the 910 thinner still by ditching the full-size port, but we prefer the future-proof yet "today-ready" out-the-box approach. The laptop's aluminium shell feels solid, while the grey finish model on review has a soft-touch finish on both its lid and interior sections. The trackpad and separate fingerprint scanner each cut their way into this material finish with more spangly embossed chamfered edging that adds to the classy look. We won't dwell on the hinge as its concept is simple: use it to swivel the screen all the way around to tablet-like form; allow the laptop to stand upright in stand mode; flip it over in a v-shape for tent mode; or use it like a simple laptop with the screen titled at any given angle. It moves easily, holds into position incredibly well and is an elegant solution indeed. There's no doubting the Yoga 910's impressive screen. Because of the trim bezel, which we've already waxed lyrical about, the laptop can squeeze a 14-inch screen into typical 13-inch real-estate. This Lenovo is almost identical in width to the smaller-screen Apple MacBook Air… it just happens to be taller, given that thicker bezel arrangement at the bottom. This size of laptop is perfect to cart around and use when on the go, or pop on a desk and use as your household laptop too. Beyond the scale, Lenovo hasn't scrimped in terms of resolution in the Yoga 910. Even at its entry-level (for the UK market) it comes with a 4K panel (3840 x 2160 pixels; elsewhere in the world there's a Full HD (1920 x 1080 pixels) model). There's an eye-watering amount of detail on display - we've really noticed the difference compared to our usual MacBook Air, with photos displaying that additional fidelity where available. However, such ultra-high resolution might see you need to adjust icon sizes within Windows, otherwise things can look tiny across the desktop and it makes using the touchscreen a little bit fiddlier. But it's easy to adjust as you please. Brightness is ample and can auto-adjust, or you can tweak the levels using the shortcut hotkeys. Sometimes when at supposed maximum brightness, however, the system will suddenly kick in an additional notch of brightness rather than it seemingly being available via manual selection, which is strange. Reflections aren't to excess, but the screen is glossier than our day-to-day Air. Given the Yoga 910 is fairly slim its keys don't have a huge degree of travel, but we've found it sufficient and comfortable with a crisp action. The way the keys sit in a sunken tray and the backlight kicks in when it's dark is in-line with other high-end laptops with full-size keys. The only downside is the small-scale shift keys. The trackpad is a responsive experience, too, but can misbehave from time to time. Its setup is unusual in the laptop world: its split down the middle from left to right, with each portion of the pad acting as a traditional left/right click on a mouse - so too often we would end up with pop-up menus on screen, rather than clicking through. It's ultra-responsive for tracking, too, so navigating around the screen is fast and effective. However, sometimes mean the deftest touch will act as a click when not desired. Until you get used to it, this ultra-responsiveness might be initially irritating. Once you are used to it, however, going back to another trackpad will feel unresponsive by comparison. One other addition that you'll notice on the Yoga 910 is a secondary sunken pad, beneath the right arrow key. Herein lies the fingerprint scanner for use with Windows Hello for rapid login. It's a great idea with the potential to expand deeper into secure payments and beyond. Not an essential, but a nice-to-have that lacks on much of the competition. Now the Yoga 910 comes in various forms, with varying degrees of power available. That ranges from the £1,299 entry-level 4K model, with an Intel Core i5 and 8GB RAM, through to an Intel Core i7 with 16GB RAM and a 512GB SSD for £1,749. 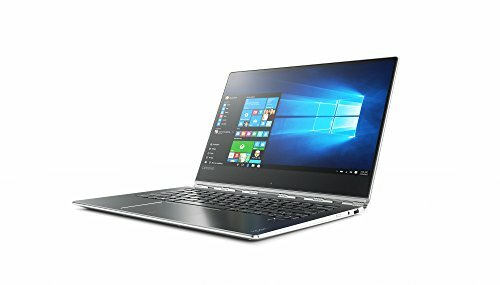 We've got the maximum settings model on review, which might well be Lenovo's way to show off just how much a slender laptop can do, but it also shows off just how flawed this concept is: because of the Yoga 910's design it can't dissipate heat particularly well and, given the high-end 7500 CPU, that means the fan kicks in at the drop of a hat. And that fan noise is horribly irksome. We've been to audio labs before; we know that laptop makers test laptops in anechoic chambers to get a sense of how their fans sound. It's almost as though Lenovo bypassed that stage with the 910 as with one Edge browser window open the fan will kick in under little pressure. Sync Bluetooth with nothing else running and - even when rested on its side so the hottest area won't be touching material and therefore letting air best reach in and out of the unit - that fan noise is relentless. We're in discussion with Lenovo and awaiting a second model for review because the earlier Yoga 900 model didn't pose such issues for us. It could well be a glitch in this particular model - something a second sample and review update will address in the near future - but we suspect it's simply that the highest-end processor option is too much for this design form. Our advice, therefore, would be to look for the so-called lower-power Intel Core i5 model because, frankly, there's still plenty of power on offer there. And as no models offer discrete graphics, the gap between one model and the next is unlikely to make a huge difference for most day-to-day tasks - unless you're always crunching through batches of big images or video, for example. With so much power under the hood and a 4K panel to render, battery life in a slim laptop is always going to take a hit. Even Lenovo thinks the 4K option will deliver a third less life per charge than the Full HD model (which you can't buy in the UK, so forget about that). Actually, even with the fan whirring away, we've not found battery life to be that bad. A bit of browsing, word processing and some music playing saw a full charge dip to 35 per cent charge over around seven hours. We would expect eight hours of use per charge to be reasonable, which is better than, say, a Surface Pro 4 or similar. To look at the Lenovo Yoga 910 is an absolute triumph. That trim bezel, ultra-high resolution and great-looking watchband hinge ensure it's one of the most striking laptops on the market, without overdoing the bling. But there's a big problem with our review sample: the fan noise as a result of, we suspect, overpowering the innards in this slender design is horribly irksome. For a laptop this pricey that shouldn't be an issue; but it's a big one, kicking in with the most menial of apps open (we wouldn't cite it as an issue if it only happened when running heavy apps). It could be an isolated incident, so we'll update this review upon receiving a second, lower-power sample if we find that to be the case. That's the Yoga 910 in short: it looks great, many elements are very well considered, it's ultra-powerful and ultra-portable given its size. But all that wonderment is scuppered by going big on the power. It's like buying a supercar with a wheel missing. And that wasn't the case with our earlier Yoga 900 or fan-free Intel Core M-powered Yoga 900S models, so those are, unexpectedly, the better options to track down. Dell has made the smallest 13-inch convertible laptop thanks to its infinity display - the minimal bezel design, which Lenovo has largely captured in its Yoga 910. Similar price points between those two do-it-all convertibles ought to see stiff competition. Read our first-look preview: Dell XPS 2-in-1 preview: The convertible king? If you're not about Windows 10 and fancy Apple's latest OS X then the MacBook Pro provides a quieter, more traditional laptop experience with plenty of power to boot. There's no touchscreen, but that's where the Touch Bar comes into play, keeping the laptop's screen nice and clean as a result. Read the full review: MacBook Pro with Touch Bar review: A touch of brilliance or totally brainless? The predecessor to the Yoga 910, the 900 has fatter bezels, but none of the fan noise issues we've experienced. Plus it'll cost you less cash too, which ought to make it the preferable choice.